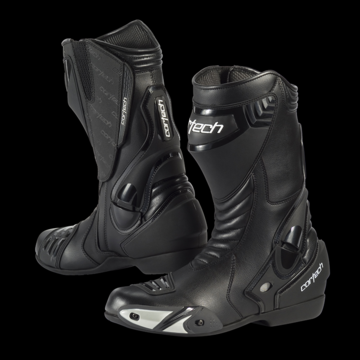 Able to endure the harshest conditions of the AMA Pro Racing schedule or keeping you comfortable on your local back roads all day. The vented Mycro Tech™ upper and Air Mesh™ lining keep you safe and cool while shock absorbing foam and a molded TPU shin guard keep you guarded against impact. The sole offers long term durability while never sacrificing grip. • HiPora® waterproof, breathable membrane. • Vented contour TPU heel protection. • Padded front and rear ankle area. • Molded plastic replaceable toe slider. • VR two-colored sole for reliable grip. • Autolock zipper covered with adjustable hook and loop fastener flap. • Leather stretch panels for better comfort and durability. • Molded TPU shin guard backed with shock absorbing material. • Shock absorbing latex foam on flex panels. • Pre-formed orthopedic vibration absorbing footbed. • TecnoGI Thermoplastic toe cap.